It is a good year for autumn colour. Even here in dank Cornwall there are trees that have ignited the hedgerows. There are masses of common Spindle growing in the newer hedges locally that I had never noticed before. I think they are part of the "one size fits all" native hedge mix that is being planted everywhere at present but they have coloured well enough to stand out. Euonymus alatus 'Compactus' has been better. I have seen it in a few in local gardens looking like the first seepage of volcanic lava from the ground before a major eruption. In a county made almost entirely of molten granite that pushed through the earths crust it should cause an occasional moments panic. When I canvass my friends, it seems I am the only one who sees things that way. It is a reliable performer and I'm not sure why I don't have one, or even a small seepage. Blueberries have also been good. The whole plant, leaves and stems, turning uniformly scarlet. The drawback is that they don't seem to produce much growth. A group of 'Duke' that I saw at Exbury last week had grown to about 48 inches tall and had approximately the same number of leaves. All of which is the preamble to an apology. In a garden filled with the richest coloured flowers and leaves of autumn I seem to have picked the palest selection possible. Sorry. 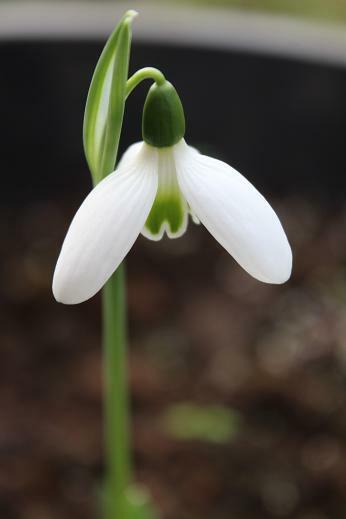 Galanthus 'Autumn Beauty' is exactly like every other autumn snowdrop in appearance and yet completely irresistible. 'Autumn Beauty' is said to be a group of chance seedlings between G. elwesii and G. reginae-olgae and they are variable. There has been a lot of speculation about the parentage but I haven't seen any statement from the raiser so I am happy to just enjoy it (with the suggestion that Autumn Beauty Group would be a better designation). The Nerine could have injected some rich colour into proceedings this week. Pink, orange, scarlet, purple and all their blended shades. The greenhouse is awash with indescribable colours. Some in shades that words have not been invented for, and some that are unspeakable. There is a deeply pleasing humour in the cacophonous innocence of Nerine sarniensis. It is as though a small child has spoken its first word and it was "****" ! It's very funny and you absolutely mustn't laugh. Nerine sarniensis can blend purple and orange with exactly the same intonation, and you are allowed to laugh (though don't try to explain the humour to an aficionado). Among this torrent of humorous and abusive colour I have picked a white one. Pure, serene and unlikely to say anything offensive. A couple of years ago I noticed the way the pure white Nerine soothed the appearance of the collection like little dabs of ointment on a sunburnt skin. 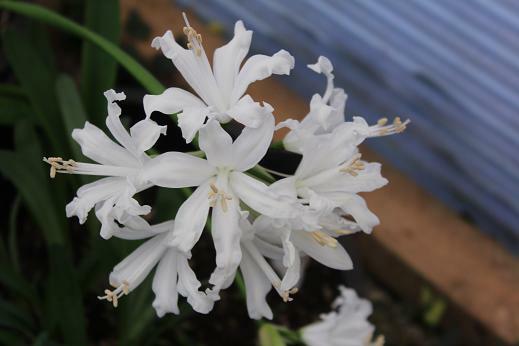 Last year I added a few more whites to the collection with the intention of crossing them at some point and raising a generation of pure white Nerine. In theory it should be a simple matter to select those with the largest heads and strongest stems since they will probably all come true to colour. Theory is all very well, but this year all of the new ones are showing signs of pink in the filaments of the stamens or in the tepal midribs. It was still only 'Blanchefleur' that had the lack of colour I wanted. Last week I bought 'Thestral' and 'Early Snow' and perhaps next year I will produce some seed at last. 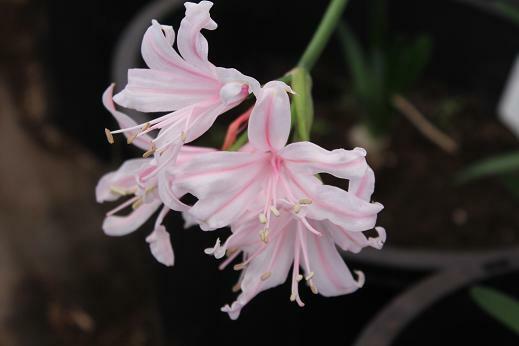 A second Nerine for the week, a pale pink tetraploid with large flowers raised at Exbury. It fits here because of the strange way things have of clumping together around ideas. There are a number of hybrids being produced between N. sarniensis and N. bowdenii. I have been looking at them recently, especially some of the new dutch hybrids. The offspring tend to have reduced fertility. Some attempts are being made to overcome this by producing tetraploid hybrids artificially and future breeding will be able to exploit the opportunities offered by tetraploid forms of the original species. 'Inchmery Kate' was the first tetraploid form of N. sarniensis raised at Exbury by Lionel de Rothschild in 1949 during the first era of the Exbury collection. None of the above would have attracted my attention had it not been for Plant Heritage, who sent a renewal form to me this week. When I was just a little seedling, twee and trite and dressed in the Nerine colours of the 1970's, there were very few plants available to those constrained by the limited financial elasticity of pocket money. Occasionally bulbs of N. sarniensis appeared in Woolworths, however one of the bulb companies offered 'Inchmery Kate'. I can't imagine how they got them and I can't remember who it was. I couldn't afford them, but how I yearned. Those are the things that stick in an impressionable mind as yet unfilled with the nonsense of daily existence. Unfortunately it seemed to have disappeared. It is strange that a plant offered so easily in a general bulb catalogue should vanish from collections so quickly. I looked for it for years without success among specialist Nerine growers and was delighted to finally get a small bulb last year through the Nerine Society. So how successful is the conservation of garden plants and who is doing it? 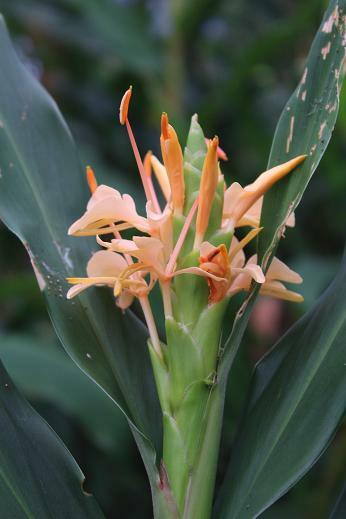 The Hedychium are having a fabulous season. A mild winter allowed them to retain leaves and some gigantic new growths appeared in spring. A long warm summer, the removal of some trees that shaded the greenhouse, and remembering to feed them more reliably have resulted in the best flowering season for some years. I bought a rhizome of 'Gahili' from Aloha Tropicals in January 2006 and it is like an old school friend. Not very interesting, not really a friend even, but thought of fondly. Someone that you have known for so long that the potential for hostility has been eroded. 'Gahili' has been with me, year after leafy year for long enough that I simply accept with good humour the absence of flowers. A kahili is a feathered standard held by the royal chiefs of Hawaii and the name has drifted to refer to plants of the genus Hedychium. I assume that 'Gahili' is a corruption of the word treated as a cultivar name somewhere along the way. I don't know where this plant was raised, but I assume it has entered cultivation through Hawaii. The pale orange flower is fairly well scented though the greenhouse is currently overwhelmed by the scent from 'Gardner Waters', 'Tai Savannah' and 'Tresco No.1'. It has been a long journey from a royal standard in Hawaii to a plastic greenhouse in Cornwall but this pale orange flower, appearing for the first time, has finally added a hint of seasonal colour.